Richard Todd stars in Michael Anderson's accurate and well made war movie. Optimum UK R2 DVD. China, 1949 - the Civil War between the Communist forces of the People's Liberation Army and the Nationalist forces is raging. The British, with the permission of the Chinese Government, have stationed a warship near the city of Nanking in order to aide the evacuation of British interests there. HMS Amethyst is sailing up river to replace HMS Consort which had been fulfilling the role. She comes under heavy and unprovoked attack from Communist artillery and despite returning fire, is heavily damaged and forced to beach on the side of the river, most of the senior crew being heavily injured after a strike to the bridge. The British dispatch Consort attempt to free Amethyst by towing her downriver, but Consort too comes under fire and is forced to retreat. With most of her crew evacuated, the British send Lt. Cmdr. Kerans (Richard Todd) to take charge of the ship and he enters negotiations with Colonel Peng of the Communist forces to try and negotiate safe passage out of the river. Experienced war movie writer Eric Ambler (The Cruel Sea (1953)) provides the script, based on the real Admiralty records of the incident. In its atmosphere and style it follows the style of the numerous British made Second World War films from the 1950s - an accurate retelling of a relatively small scale story within the ongoing war, including characters closely based on the real people. The opening narration apologises that changes have had to be made to the story due to the limitations of time available and the depiction of the incident has been duly compressed somewhat - there were actually two seperate attacks on the ship an hour apart, with only the second attack causing enough damage to force the ship aground; later the ship was able to move up river away from the Chinese guns rather than being continually under their watch as the film suggests. Due to the compression, some events, like the evacuation of the wounded soldiers remain unclear. However, the majority of the details are present and correct and the film offers a neat summary of the real event. As a film in its own right, Yangtse Incident is well written. The opening is curt and effective - a narration introduces us to the scenario while the first scene is a roving pan along the ship showing us life aboard and introducing most of the main characters, it moves quickly into the first attack. Pacing is generally slow and much of the film consists of the actions aboard the beached ship, but it certainly never drags and plenty of time is given to building up effective characterisation. The film does not bow down to cinematic pressures to add fictional action scenes, romance or a cliché villainous officer subplot. 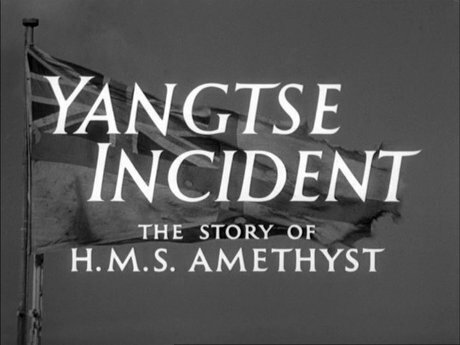 Again, like the Second World War films made at the same time, Yangtse Incident does not set out to completely villify the opponenets, but does not focus much time on them - in particular it does not attempt to speculate on why the communist forces initially decided to attack the British ship when they did, or provide any scenes of the Chinese troops outside of their meetings with the British sailors. The tone of the film is certainly patriotic but never shies away from the deaths and injuries sustained by the British forces, a few light hearted scenes courtesy of the character Leading Seaman Frank provide some relief but are in tune with the way that the soldiers would have tried to keep themselves amused, rather than becoming all-out comedy scenes. Director Michael Anderson, fresh off the iconic Second World War film The Dam Busters (1955) was the obvious choice to helm this production and does an outstanding job. He is aided enourmously by the availability of Amethyst herself, along with her sister ship Magpie for the filming, this allows the production to avoid model shots for the exteriors and we are treated to the breathtaking sight of the ship really opening fire with all guns, rather than use of stock footage. Model shots are used during the film's climax and are well made. The exterior scenes were shot in East Anglia where the flat landscape is similar to that of the Jiangsu Province where the real incident took place, a few Chinese boats and a small cast of Chinese extras help to set the scene. Richard Todd is top billed here, he had become a popular commodity, particularly in war films, appearing in Anderson's Dam Busters as well as D-Day the Sixth of June (1956) and his own military experience gives him a genuine gravitas in the part. William Hartnell (best remembered today as the first Doctor Who) is well cast as Leading Seaman Frank and plays well during the light hearted scenes, while a number of familiar faces crop up in the rest of the cast, including Sam Kydd, Robert Urquhart and Donald Houston. A well written and largely accurate script along with some fine direction (aided by the availability of the original warship for exterior shots) and a typically strong lead performance from Richard Todd make Yangtse Incident a very strong film and a fitting tribute to those involved. Recommended to fans of classic war films. Directed by anyone	interesting? Michael Anderson - a British director who is best known for his war film The Dam Busters (1955) and the dystopian sci-fi Logan's Run (1976) but he directed a wide selection of films in many genres. Any gore or violence ? Several deaths, only a small amount of blood. Who is it for? Fans classic war films will enjoy this, certainly of interest to fans of Richard Todd or Michael Anderson. Visuals Aspect Ratio - 1.33:1 fullscreen. Black and White. The film would have been shown in 1.66:1 in cinemas (possibly cropped to 1.78:1 in the US). This print may therefore be open-matte or pan/scanned. There is no apparent cropping, nor is there any visible equipment in shot. The print quality is generally strong with no damage and good detail. Some of the exterior shots are quite grainy. Audio Original English mono - sounds fine throughout. A well made, well written and well acted war film - recommended to all classic war film fans. A strong print which does not appear to suffer from being shown in full screen, although no extras at all. Thanks to John Hodson for notes on aspect ratio. All text in this review written by Timothy Young - 12th March 2009.